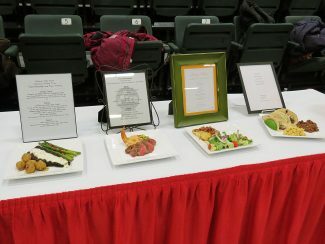 Prepared plates during the team competition of the event. 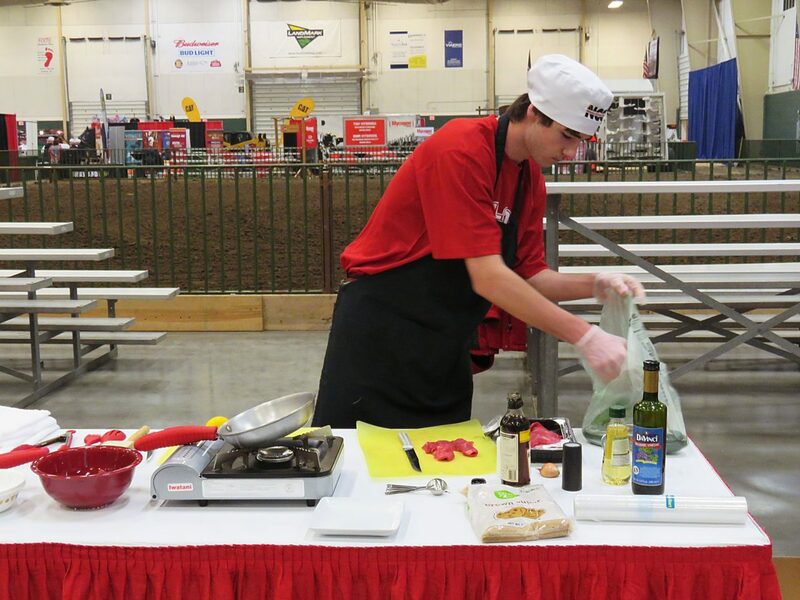 Calling all high school chefs, the Nebraska Cattlemen's Classic is looking for contestants for the third annual Family and Consumer Science Cookin' at the Classic Beef Culinary contest. This year's contest will be at 8:30 a.m., Feb. 19 at the Buffalo County Fairgrounds in Kearney. The event will start with a demonstration by a chef. According to Sheri Wieden, who coordinates the event, the contest is a big opportunity for FCS students to learn more about beef, and apply what they have learned in the classroom in an actual contest, where they can showcase their talents. High school students who have taken an FCS class are eligible for the contest. They can compete in one of two divisions. In the team division, consisting of three or four students, they prepare a meal consisting of beef as the main dish, with a starch and vegetable as sides. They must prepare the dish within an hour with no electricity, and only two butane burners to cook with. "They have to prepare everything from scratch, and it takes teamwork, planning, selection, flavor and taste to win this contest," Wieden said. Ryan Melroy of Kearney High School, who entered last year's contest with teammate, Drew Hardage, explained that he entered the contest because he hopes to become a culinary chef. "It was my first year in this contest, but I eventually hope to go into a culinary arts program after high school. Some day, I would like to own my own restaurant. This contest is good practice for that," he said. In the individual competition, students have 30 minutes to prepare an appetizer of their choice from scratch, also with no electricity and only a butane burner for cooking. Three judges walk around and observe, asking the students questions during the preparation process. The appetizer will be sampled by the judges when it's finished. The contest is free to enter, and students don't have to live in Nebraska to be eligible to compete. Prizes are awarded to the winners. "The contest does take some preparation," Wieden said. "The students will have to work with their FCS teachers to spend some time looking at recipes, and finding something that fits within the time constraints. Then, they will need to select a menu, and practice in their classroom to get the recipe ready as far as flavors and seasonings. They have to bring everything they will need for the contest with them, except the butane burners, which we provide," she explained. Three prep judges will observe the students, evaluating how they work as a team and if they are using the correct methods. Afterward, four tasting judges will evaluate each plate for appearance and flavor. Last year, Lindsay Higel, who is the director of the culinary and hospitality program at Central Community College in Hastings, brought several of her students to serve as official judges. "I think contests like this teach students to plan ahead, and be able to execute that plan within the time allotment," she said. "We want to see them make a plan that will be successful, and teach them how versatile beef really is." During the last two years, Carol Kreutzer, who is an FCS teacher at Kearney High School, has had several students compete in the contest. "I encourage them to compete because I want them to see different avenues to use their culinary skills," she said. 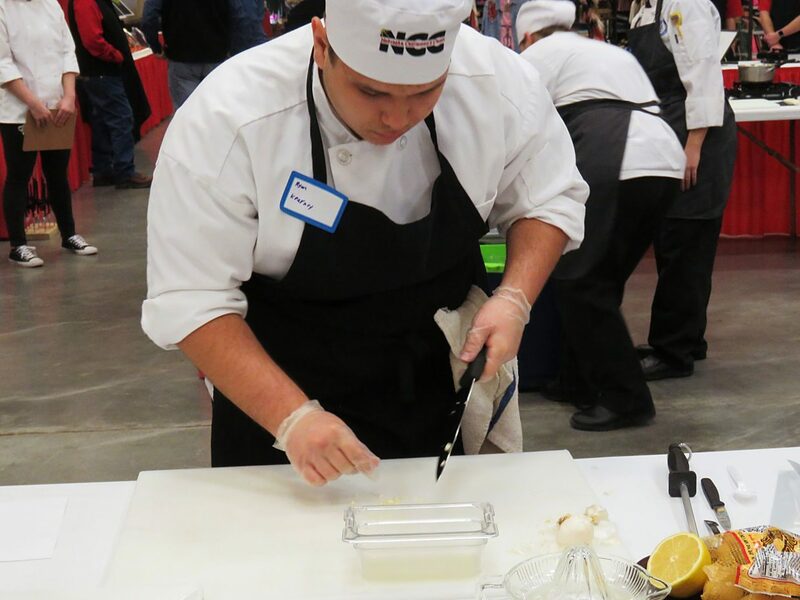 "It reinforces the concepts I teach in ProStart, and it gives credibility to my program as a viable career pathway. As individuals, I think competition is great. It motivates the students to put a product out that others judge. I believe that students try hard to do their best, because someone sees what they are doing. Also, the recognition that comes with competition can be a boost for their self-image and self-esteem. There is a sense of pride in accomplishing a task that others value," she said. "The contest requires a lot of planning, teamwork and decision-making," Wieden said. "The students must work as part of a team, and make a lot of decisions during the contest. Some will be split-second. They will also need to work under pressure to address problems if something doesn't quite turn out right. The point of the contest is to teach the students more about beef, and how it is prepared." It also teaches students time management, performing for an audience, how to accept constructive criticism, cooking skills and work ethic, Kreutzer added.